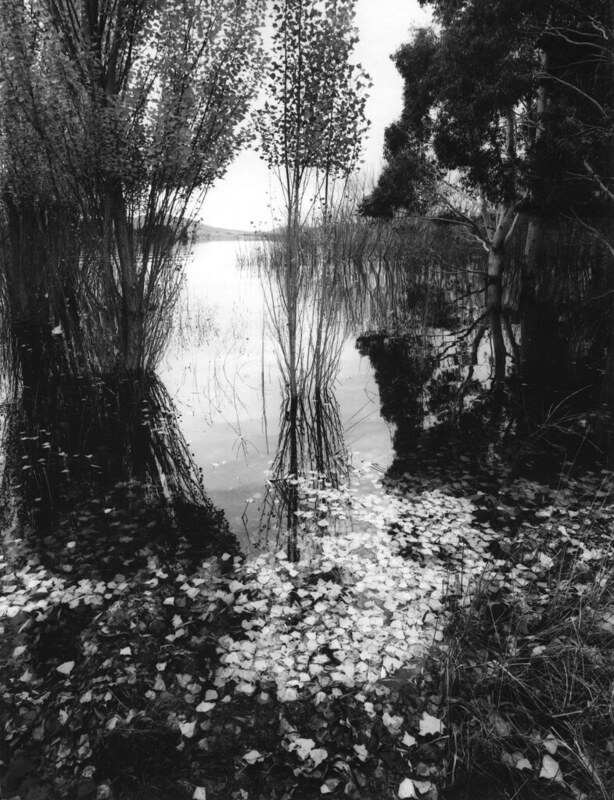 Film: Late Fall, Lake Jindabyne. Gelatin-silver photograph on Ultrafine Silver Eagle VC FB photographic paper, image size 21.3cm X 16.4cm, from a Fomapan 400 4x5 negative exposed in a Tachihara 45GF double extension field view camera fitted with a Schneider Super Angulon 75mm f5.6 lens and a #25 red filter. Titled and signed recto, stamped and annotated verso. "It is pleasant to walk over the beds of these fresh, crisp, and rustling leaves. How beautifully they go to their graves, how gently lay themselves down and turn to mold!--painted of a thousand hues, and fit to make the beds of us living. How many flutterings before they rest quietly in their graves! They that soared so loftily, how contentedly they return to dust. again, and are laid low, resigned to lie and decay at the foot of a tree, and afford nourishment to new generations of their kind, as well as to flutter on high! They teach us how to die. One wonders if the time will ever come when men, with their boasted faith in immortality, will lie down as graceful and as ripe..."
You know, for some strange reason, the bottom third reminds of this etching M.C.escher did of a lake covered with leaves turning into a forest turning into birds. Strangely enough, I think the horizon is actually lower in the image. Nice work. Not only is the picture in itself a great experience with the detail and light in the illuminated foreground carpet of bright leaves, but the added treat of an evocative quote by Thoreau, makes a special treat! Thanks for sharing and also investing the extra time in the apt quote. I feel quite a bit richer for your generosity and raking pains! How art is presented is too often not considered well enough by many of us! Who'd have thought that the descendants of those sent to Australia and those who volunteered for that journey, would give rise to such a rich production of film, acting and photography that really seems out of proportion to the size of the population!